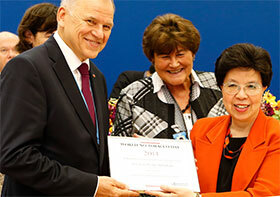 Vytenis Andriukaitis, former Minister of Health of Lithuania and EU Commissioner-designate for health and food safety receives the WHO World No Tobacco Day award from Zsuzsanna Jakab, WHO Regional Director for Europe and Margaret Chan, WHO Director-General. One of her many concerns was the lack of incentive for research and development (R&D) to develop medicines to tackle Ebola virus disease, as it had been confined to poor African nations throughout its nearly forty-year history. “Now people see the reality of this R&D failure, this market failure, on TV screens and in the headline news: the world’s empty-handed clinicians in their hazmat suits, trying to help Africa’s desperate poor, putting their own lives at risk and losing them,” added the Director-General. Positive developments, however, included WHO’s moving quickly to advise on the use of experimental medicines and vaccines during the outbreak, which may lead to drugs and vaccines against Ebola being available soon. The Director-General concluded by asking Member States also to address the critical health needs in the WHO European Region that would be discussed by RC64. In response, Member States expressed their sympathy for those affected by the Ebola outbreak, thanked the Director-General for WHO’s role in coordinating the response, and stressed the needs to operationalize the WHO roadmap and to continue to support work to strengthen health systems. The latter included addressing both health-workforce shortages and challenges related to implementing the International Health Regulations (IHR) resulting from the emergency. Speaking on behalf of the Member States of the European Union (EU), the representative of Italy expressed deep concern about the Ebola crisis, recognized the urgent need to maintain and re-establish transport links in the affected region and explained that the EU and its Member States were “working actively to reduce the isolation of this region”. Referring to the suspension of some air services to the countries affected, against WHO recommendations, the representative of France called for a pragmatic approach to enforcing the IHR. The representative of the Netherlands requested WHO’s guidance on making progress on the issue of equal and nondiscriminatory access to health care. The United Kingdom thanked the Director-General for her “powerful address, to which we all must respond”. The emergency required a broad, strategic response in the short, medium and long terms, so the United Kingdom was deploying a medical team to establish a medical facility in Sierra Leone, beginning with 12 beds but later increasing to 50. In the medium term, investing in health systems must be a stronger part of international development work and, in the long term, all must take a “One Health” approach and work together to recognize the threat to global health of such issues as antimicrobial resistance (AMR). The representative of Germany agreed that the Ebola emergency showed the need to develop health care capacities in countries, and hoped that the global threat of AMR would be pushed higher on the political agenda. Switzerland stressed the need to develop vaccines and medicines to tackle the Ebola outbreak, and underlined its support for the work of the Consultative Expert Working Group on Research and Development: Financing and Coordination. Referring to the IHR, the representative of Monaco said that the Ebola outbreak illustrated the need for stronger cooperation and coordination within the United Nations family, and with the civil and private sectors, and underlined that WHO must continue its reform process in order to respond effectively. In response, the Director-General called the Ebola outbreak “the biggest of all crises that I have seen in my experience, in terms of complexity. There is no medicine against fear.” A lack of financial resources or supplies was not the greatest challenge; that was the lack of trained medical staff, with the discipline to implement effective infection control. At a short ceremony, a representative of the European Commission and the Irish and Lithuanian delegations (on behalf of their EU presidencies) received World No Tobacco Day awards, in recognition of their work in ensuring that the revised EU Tobacco Products Directive was adopted in February 2014. The WHO European Region had the highest rate of adult smokers (28%) in the world. The President of Turkmenistan had received a Special Recognition certificate earlier in 2014, during the visit of the Director-General and Regional Director to the country, and the Regional Director would present the Prime Minister of the Republic of Moldova with an award in October. In a bilateral morning meeting, the Ministry of Health of Cyprus and WHO signed the CCS, setting up a medium-term framework for cooperation for 2015–2020. The Regional Director and Agis Tsouros, Director of the Division of Policy and Governance for Health and Well-being, presented the first formal progress report on Health 2020 to RC64. The Regional Director explained, “Health is a political choice.” She described the significant improvements that could be seen across the European Region since the adoption of Health 2020: evidence that Member States took it seriously. Two notable advances in the implementation of the policy framework were: stronger capacity for cross-sectoral collaboration and the incorporation of health into national and regional agendas. “But we still have a long way to go,” said the Regional Director. Agis Tsouros noted that “Policies and strategies can get a bad name if not implemented, even if they are in fact visionary”, and defined Health 2020 as a coherent tool enabling governments to “start anywhere”. In a debate involving 30 Member States, speakers uniformly supported Health 2020 and applauded the progress made in unifying the Region around a common goal and broad agenda. Country by country, representatives described their various strategies, plans and policies related to Health 2020 and the manner in which Health 2020 had been implemented, citing examples of partnerships across government sectors, improved policy to reduce inequities and renewed focus on the life-course approach to health. The Norwegian representative expressed the view of the Nordic countries, which shared a long tradition of partnership: that all countries faced the challenge of equity in health, which must be addressed head on. Referring to the 2014 Trondheim Declaration, he said that inequity did not occur naturally, and that the right to health was at the heart of the Nordic countries’ work. Iceland expressed gratitude for the shift toward horizontal approach to health and towards the individual, which appealed strongly to the Icelandic people. While support was overwhelming, many speakers raised a common refrain: that much work still needed to be done to take Health 2020 forward. Cyprus, Greece, Israel, Portugal and Spain requested an intensified focus on migration as a priority concern. Finland called for intensified work on the social determinants for health, as a helpful addition to the current framework. A representative of the International Federation of Medical Student Associations (IFMSA) asked that young people be actively included in the implementation of Health 2020, and expressed IFMSA’s commitment to extending and strengthening it. A representative of the International Alliance of Patients’ Organizations (IAPO) welcomed the linking of Health 2020’s targets to equity, but called for more to be done to ensure affordable and equitable access to health care for all. Ministers and heads of delegation discussed how best to invest in early childhood development during a lunchtime meeting. Action taken early in childhood could ensure that children reach their full potential. Health systems had a critical role to play in ensuring an equitable start in life for all children. Countries varied widely in the support provided very early in life. The best systems offered personalized, continuous support during pregnancy, a choice of birth arrangements, postnatal support and advice, and paid parental leave for mothers and fathers. Countries also differed in the provision of early childhood care and education before statutory school age. An ideal system provided high-quality, affordable, accessible child care, flexible enough to enable either parent to return to work. RC64 would discuss the proposed European child and adolescent health strategy 2015–2020 and European child maltreatment prevention action plan 2015–2020 on the following day. Although discussion of the proposed country strategy had been deferred, pending the development of a global strategy, some of its recommendations were being implemented. A technical briefing gave an overview of WHO/Europe’s work in countries. The roles and benefits of small, medium and large country offices were explained. These roles included: providing policy advice and building capacity; ensuring consistency among technical programmes; coordinating and engaging with the rest of the United Nations system; supporting information exchange, advocacy and communications; and coordinating with countries at the bilateral and subregional levels. Larger country offices could also do programmatic and project work, which could then be tested and scaled up at the national level if appropriate; support the mobilization of funding; and advocate the importance of health among national and international partners in emergencies. The strategic desk office at WHO/Europe provided intelligence and an overview of collaboration in countries, and offered support to Member States without country offices. A representative of Slovenia expressed her appreciation for the work of country offices, particularly as a reference point for what was happening in countries. She described the establishment of national coordinators as a positive step. Other representatives echoed these comments. Acting on the proposal of a private meeting on elections and nominations, RC64 nominated Zsuzsanna Jakab to serve a second term as WHO Regional Director for Europe. The nomination would be submitted to the WHO Executive Board, which would meet in January 2015. The Board was expected to endorse the nomination, with the Regional Director’s second term beginning on 1 February 2015. In addition, RC64 nominated four members of the Executive Board – France, Kazakhstan, Malta and Sweden – and elected Germany, Portugal, Romania and Turkmenistan to the Standing Committee of the Regional Committee (SCRC). Further, the Republic of Moldova was elected to the Joint Coordinating Board of the Special Programme for Research and Training in Tropical Diseases, and Spain was elected to the Policy and Coordination Committee of the Special Programme of Research, Development and Research Training in Human Reproduction. Dr Hans Troedsson, WHO Assistant Director-General for General Management, said that the objective of the work on strategic budget space allocation was to revise and validate the biennial budget envelopes allocated to WHO headquarters and the six regional offices, and to work out an objective methodology for that. A global working group – consisting of six members of the Programme Budget and Administration Committee (PBAC) of the Executive Board and led by Belgium – was established to guide this work. The Sixty-seventh World Health Assembly supported the working group’s proposal and recommendations. A revised paper with concrete proposals would be prepared by November and would be discussed by the Executive Board in January 2015. Dr Daniel Reynders of Belgium, chair of the SCRC’s subgroup on strategic budget space allocation, reported that the subgroup’s work had provided important input into the global process. While the results of the process would have important implications for the European Region, it was important to maintain a global perspective and spirit. A report summarizing the SCRC subgroup’s deliberations had been sent to the global working group. The methodology for strategic budget space allocation should reflect the budgetary impact of World Health Assembly and Regional Committee resolutions, because these greatly limited the room for manoeuvre. During the debate, Monaco asked for broad consultation with the Member States in the Region as quickly as possible, and warned that care should be taken over definitions as they could have political implications. Germany praised the subgroup’s extraordinary work on a very politically sensitive topic, emphasized that the complicated work of strategic budget space allocation should not be rushed and therefore suggested maintaining the budgetary envelopes of major offices at the current level in 2016–2017, until a proper methodology was established. Noting that the budget should remain stable for the next biennium, Dr Troedsson agreed that finding a sustainable solution would take time and require extensive consultation. Dr Gaudenz Silberschmidt, from WHO headquarters, explained that WHO had always engaged with non-State actors and was mandated to do so in its Constitution. The reform process had involved the whole Organization and lasted two years, but a framework agreement had been developed including issues raised by Member States, such as conflicts of interest, due diligence and management of financial resources from private-sector entities. At an informal consultation on Sunday, 14 September, 20 Member States had held a frank and constructive discussion. They had reached general agreement that the framework should be adopted and identified two elements for improvement: conflicts of interest and the timetable for evaluation. In the discussion, France stressed the importance of the proposal to WHO reform and called on Member States to support it unanimously. The representative from Finland said the framework enabled collaboration while maintaining integrity. Greece pointed out that multisectoral partnerships with governments and non-State actors were necessary to protect health. The representative from the Russian Federation welcomed WHO’s success in increasing transparency, especially in work with partners, but expressed concern about taking irreversible action, advocating the possibility of revisiting the issue at a later date. Switzerland said it was important to give a clear signal of support while recognizing that the area of conflicts of interest could be further improved. The representative from Turkey urged WHO to push through its reforms, pointing out that vulnerabilities could be turned into assets. A representative of IAPO stressed the importance of placing NGOs at the heart of WHO activities. In response, Dr Silberschmidt directed representatives to the reform website for further information. RC64 agreed to include in its report a statement on the Region’s position on the draft framework for engagement with non-State actors.